Worms From Your Cat - Protect Yourself! "Yes, it's possible for humans to be infected by certain cat worms." Roundworms, hookworms and tapeworms are parasites that can be found in your cat's feces. Although not technically a worm, ringworm is a fungus that can be passed from your cat's infected skin or fur to you. When transmitted to humans, cat roundworms (Toxocara cati) can be mild and long-lasting, but are rarely fatal. Roundworms can live in your cat's small intestine, so these worms are sometimes referred to as "intestinal roundworms." The roundworm infection to humans comes from being exposed to this worm's eggs, usually found in your feline's feces. Roundworm from dogs is more common than from cats. Unfortunately, it's difficult to diagnose and treat this type of infection in people. How Do Humans Get Roundworms from Cats? In order for intestinal roundworms to be transmitted to humans, you would have to ingest the eggs of this parasite. The eggs then hatch in the human intestinal tract and the immature roundworms migrate to tissues in the body. Roundworms can migrate to any tissues in the body, including the brain and the eyes. This type of infection occurring in humans is called "visceral larval migrans" or VLM. Roundworm is most often seen in toddlers who play where a cat has defecated, then puts his or her unwashed hands in his or her mouth. The worm's eggs incubate for several weeks in the ground or kitty litter (or sandbox) where your kitty defecates. To be infected, the child (or other person) would have to swallow the eggs. Always wash your hands after playing with or around pets. And be sure to have your children wash their hands, too. Cat hookworms (A. braziliense) are parasites similar to roundworms. Technically, hookworms are a type of roundworms. These worms from your cat can get into human bodies from the infectious larvae of the worm. The larvae can be found in your kitty's feces, so if you have contact with the feces, you can get hookworm. The larvae directly penetrate your skin at the point of contact. The contact is usually with feces-contaminated soil, sand, or kitty litter (often through bare feet). Once the larvae penetrate human skin, they cause an intense inflammatory reaction called "cutaneous (or dermal) larval migrans" (CLM). Hookworms will move around several inches under your skin and eventually die. Your skin inflammation should end after several months or weeks, but in the meantime, it can be extremely uncomfortable. You guessed it. Wash your hands after playing with or being around pets; and especially after cleaning the litter box. Fleas are the intermediate hosts of the tapeworm. Fleas eat the tapeworm eggs; then the tapeworm egg grows into a larval stage in the flea. You would then have to ingest a flea in order to get tapeworm. 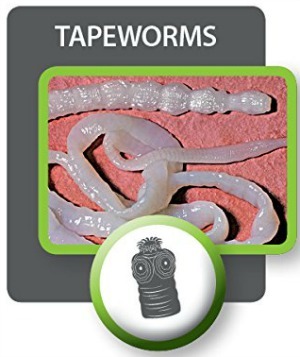 It's the larvae of the tapeworm that grows into a tapeworm and is infective to people (and other animals). If you were to accidentally ingest the eggs (called proglottids) of the tapeworm, the eggs would pass through your digestive tract and be eliminated through the feces. It is possible for humans to ingest fleas when they are nuzzling with their cats or on the rare occasion of your cat licking your mouth while a flea is on her tongue. As you can see, it's pretty hard for you to get tapeworm from your cat. Most infections occur in very young children. Unlike other worms from your cats, ringworm is not technically a cat worm. It's caused by several different types of fungi. 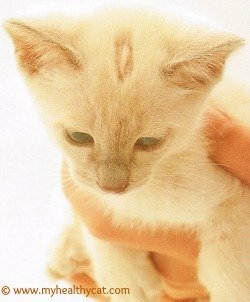 Ringworm is a skin and scalp disease that you can easily get from your infected cat (or other pet) merely by touching their infected skin or fur. Signs that your cat has ringworm include losing patches of fur and a lesion that is often ring-shaped and itchy. In some cats, especially long-haired cats, you cannot tell they have ringworm. In humans, ringworm will also be ring-shaped. It will be a reddish and itchy rash and can be dry and scaly or wet and crusty. Humans can also get ringworm from other infected people or from personal items that have been touched by the fungus. Ringworm is treated in people by topical and oral medications. Keep it clean! Wash your hands! This is the best advice to protect yourself from worms from your cat. Wash your hands after petting an animal or cleaning the litter box. If you are in areas where animals may defecate (such as the beach), be sure to wear shoes and/or wash your feet as soon as possible. Teach children that it's dangerous to eat soil or dirt and that they should wash their hands with soap and water after playing with pets. Effective flea control is also an essential part of preventing tapeworm in your cat and you. If you suspect that your cat or kitten is suffering from any of these types of worms in cats, it's best to get veterinary advice or treatment immediately to prevent the infestation in your kitty from becoming worse. This will help protect other pets and the humans in your life who can get worms from your cat. If caught early, many of these parasites are easily gotten rid of with conventional worming medication or natural homeopathic remedies. Worms in Cats - Here's more information about the common types of worms your cat can get. 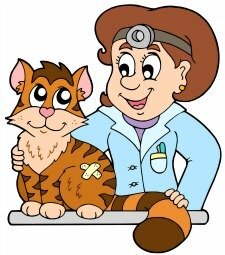 Common Cat Health Problems - Article about common feline health issues you should be aware of when you care for a kitty.